In the channels of Online Marketing, Social Media Marketing is not just one channel customer care to share, spread on social networking website will help the government become more powerful. This article will guide sharing automatically posts to the 2 biggest social networks: Facebook & Twitter . We will use the built-in tools Socialize in Feedburner (Google bought the product) to do this. STEP 3 - Select Add a Twitter Account. Twitter will ask you whether to allow Google to connect with Twitter? 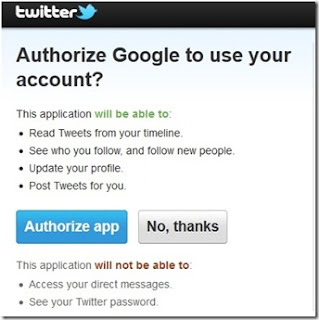 Of course, choose Authorize app. Return to display Google feedburner you click Activate is complete. Your article later will automatically Tweet on Twitter by Feedburner. Twitter login select Settings -> Profile -> Scroll down and select connecting to Facebook profile and Facebook fanpage then Save. our Twitter was connected with facebook profile and facebook fanpage. From now on every website has one new article, it will be automatically posted to Twitter via Google Feedburner and Twitter will take over Facebook profiles, facebook fanpage.